Purchase a two part epoxy resin at a local home improvement store. Below is an example of a product that has been used. 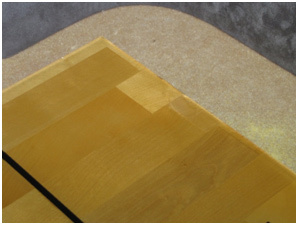 Prepare the damaged area by removing all dust and dirt as per the epoxy instructions. The following image shows a hole into which the mixed epoxy will be poured. 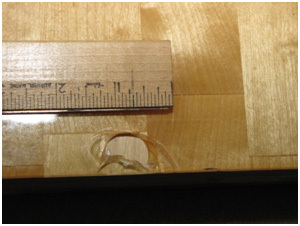 If the damage is on an edge or a corner it will be necessary to build a frame to hold in the epoxy as shown on the right. Cardboard taped to the side of the playfield will suffice. Pour the mixed epoxy into the hole and let the epoxy fully cure according to the instructions. If necessary, sand the area with 1500 grit wet sandpaper and the buff with a soft cloth and polishing compound. Below is a photo of the repair of the damage above.